My grandson developed a milk allergy so what do we do for birthday cake? I took my reading glasses and went to the supermarket and read every box of cake and frosting. I found Price Chopper vanilla cake mix, Price Chopper chocolate fudge and vanilla frosting. I am ready to get baking. 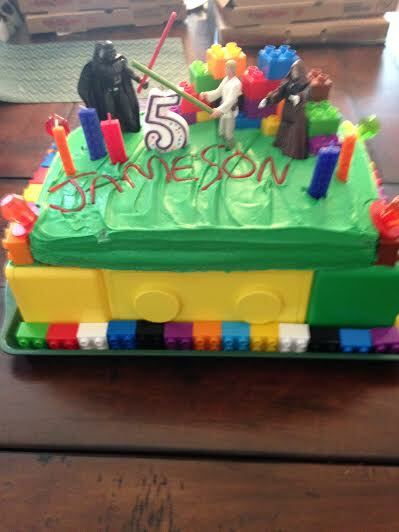 Then my grandson wanted a green lego star war cake. Thank God my sister, Janet, has more imagination than me. She found these lego boxes that we used as a base. I baked two 9×12 cakes and used the chocolate frosting as a filling. Then we put food coloring in the vanilla frosting and made it green. Frosted the entire cake and then decorated it with legos, star war figures and lego candles. My grandsons name was written in string candy. He loved the cake and that was the best compliment I could ever get.